Road traffic management is an important point of discussion in many cities around the world. 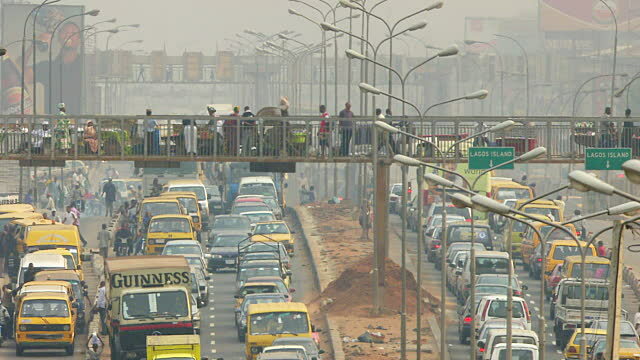 We investigate global developments in congestion reduction and makes suggestions on how some of these traffic management strategies can be applied to congestion in Lagos. You are delayed in the traffic, waiting for the signal to turn green. When it finally does, you inch forward to make it through the intersection, like the many cars around you. Just when you are close to making it through, the light turns red or the traffic warden flashes the ‘STOP’ sign. You have to hit the brakes again, only to repeat the process. Most drivers in Lagos state can relate to this frustrating scenario, whether they’re headed for work or out shopping, either in their personal vehicles or even when using public transport. With over five million cars and 200,000 commercial vehicles on the roads, Lagos has on average about 327 vehicles per kilometre of roads. The Lagos State Government, however is already taking measures to handle this situation. One of such approaches is to restrict commercial vehicles from plying main roads like Broad Street and Apongbon in the central business district. Another is the crackdown on street trading. Furthermore, agencies such as LASTMA, LASDRI and LAMATA were created mainly to ease congestion and deal with traffic offenders. The BRT (Bus Rapid Transit) initiative, whose first phase was opened on March 2008, was inaugurated by the Lagos State Government during the administration of governor Bola Tinubu. It also forms part of the arrangement to reduce congestion by encouraging commuters to switch to public transit. Lagos Traffic Radio 96.1FM, is another initiative to enable motorists and commuters to gain first hand information on transport conditions and traffic news. A few solar-powered intelligence traffic lights were also installed at major intersections that were identified for synchronization in 2013. While these actions of the government show a genuine concern to curb traffic congestion, they are not sufficient. A growing number of countries and cities worldwide are trying to tackle the issue of traffic congestion by improving the way traffic lights are synchronized. A survey carried out by the Transportation Research Board (TRB) of the National Academies, USA, showed that in 2014, only about 3% (roughly 6,500) of traffic signals in the US used adaptive systems. In Canada, adaptive systems are less common, with only a little over 1%. The major reason why adaptive traffic control systems were incorporated was to investigate the daily and weekly fluctuations in traffic flows and to control it where necessary. The United States is continually expanding its adaptive traffic management system which in addition to the use of electromagnetic loops, CCTV and radar to enhance the collection, transfer and analysis of traffic data. Lagos could do with an adaptive traffic control system, as its traffic wardens and signal infrastructure are over-burdened by congestion and rush-hour travel. However, a quick look at what it would take to upgrade to this type of system makes it obvious that its implementation would be very expensive. On average, the cost of installing an advanced traffic control system is approximately $65,000 per intersection. This pays for new local hardware and software at the intersection, as well as new communication infrastructure to operate the system. Apart from these cost concerns, adaptive traffic management systems are maintenance-intensive. There is usually an additional overhead for maintenance and it would require substantial labour and technical expertise to keep such systems running. Less fuel will be consumed by vehicles. There would be increased in traffic efficiency around the city. There is decreased time between signal changes, and thus traffic flows better. It would prioritize public transport and emergency vehicles. This system would give consideration to roadwork and other construction. There would be reduced air pollution from idling. Conduct a pilot installation to observe the operational benefits of the system and secure public support. Factors that may hinder the adaptive traffic control system in Lagos State include the high cost of installation and maintenance. From my interactions with other Lagosians, most road users would prefer that damaged roads are repaired and pedestrian infrastructure improved, before committing to an expense such as the adaptive traffic control system. In my opinion, however, it would be a good investment for the Lagos metropolis and its 20 million residents, since it is a very congested city.